Many companies we start to work with think that their explainer video is the end product. But in terms of brand assets and how you can use them, your explainer video is really just the beginning. 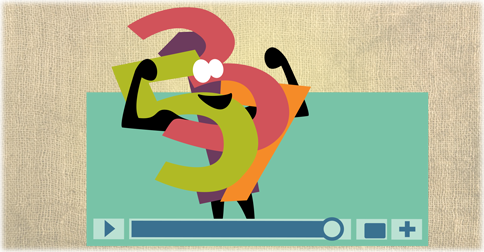 A lot goes into the process of creating an explainer video for any brand or service. Obviously a starting point is any brand guidelines or standards the company may have existing. If there are certain colors we should use, certain fonts or certain stylized treatments is taken into account before we start work on any explainer video. If none of these things exist, then we get to roll up our sleeves and flex our creativity to create these styles around a brand. We usually start by looking at the logo, website treatment and any social media channels first. We want to be sure that whatever we create is going to look like an extension of the brand. In doing all of this and in writing the script, we usually develop some iconography or characters that can extend into marketing efforts beyond just the explainer video. This iconography or characters could be used in a multitude of ways. Characters could be used within an infographic design, or iconographic styling could be used within follow up sales emails, white papers and more. It could extend into banner ads, video ad units or even offline into sales literature and direct mail pieces. Your imagination and budget are all that really limit you. A natural first extension should be on the video landing page. NOBL Communications created a great landing page for the Social Scape video we created for them and integrated the characters we created for them into the design. nDash Marketing named the “marketing beast” we created for their explainer video “Markey” and he’s made appearances in their social media as well as become the website “mascot”. Another example is the explainer video we created for Broadridge for their FundPOINT product. The “data” character we created made his way into a series of direct mail postcards including QR codes which directed the recipient to the product page featuring the video. These are a few varied examples of how individual clients have put some of the brand assets to work that we’ve created for their videos. There are many more examples and I could easily write several more blog posts with all the unique examples of how the characters and graphics we’ve created have extended beyond just the explainer video. Think of “Flo” from Progressive or Geico’s “Gecko” these brand characters are used everywhere from television ads, magazine ads and billboards to banner ads. In many cases, the characters have become more recognizable than the companies logos. So when you’re starting to think about an explainer video, don’t think of what’s created as stopping with the video. Think how those characters and graphics that will be developed during the course of your explainer video production can live on and extend into every facet of your marketing strategy. Or you can get us involved and we can help you brainstorm ideas. Just throwing that out there.